The BSNL Penta T-Pad 703C HV was launched keeping in mind the people who need to stick to a budget, while not compromising processing power and performance. Available now in India for the price of Rs. 6,999, the BSNL Penta T-Pad 703C HV is readily available at discounted prices online, which can drop to as low as Rs. 5,989 for the 8 GB model. Here are a couple of things that customers must keep in mind before buying the BSNL Penta T-Pad 703C HV. 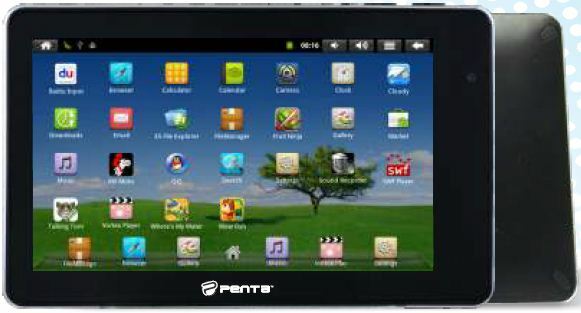 The BSNL Penta T-Pad 703C HV comes pre-installed with Android 4.0 (Ice Cream Sandwich), which is one of the most stable and best user interface Android Operating Systems on the market. The tablet takes its design in the bar form, with a sturdy 7 inch capacitive touch screen. The screen registers touch gestures with relative ease, unlike many of the tablets in its range. The display resolution is a very decent 800 x 480 pixels, giving the screen a radiant glow. The BSNL Penta T-Pad 703C HV has full WiFi connectivity to access the Internet. Please note: There is no scope for any SIM card installation in this Tablet – hence you cannot make calls. It does not support Bluetooth. An alternative for Internet connectivity is 3G through USB – It supports a good range of 3G USB Dongles that can run on GSM/CDMA or EVDO. However, with WiFi, or an USB dongle, connection to Skype is a breeze and is an excellent option to use to keep in touch with people who matter. The BSNL T-Pad 703C HV is powered by 1GHz ARM Cortex A8 processor, which immediately puts it in the league of very good tablets. The processor is fast enough to never lag, hang or get stuck. Couple that with 1 GB of RAM and you have yourself a Tablet that has the best value for money compared to even some tablets which are higher priced than this one. The storage can be expanded by 32GB more; making sure you’ll never look for extra space to store the movies, games and songs that you love. With a 4000 mAh battery, this Tablet demonstrates a very decent battery life; even with full blown WiFi enabled, it lasts on an average of 4 to 6 hours. Along with full HD display output through the HDMI port, the Tablet features 2 cameras – front and back, for video calling through Skype and clicking photos of what’s around you, respectively. It comes with preinstalled applications like MSN Messenger, Skype and QQ, along with a fully functional Internet Browser, making this Tablet a jack of all trades, and integrating all the essentials into one neat package.